Receive me today, o Son of God, as a partaker of Thy mystical Supper; for I will not tell of the mystery to Thy enemies, I will not give Thee a kiss as did Judas; but like the thief, I confess to Thee: Remember me, o Lord, in Thy kingdom! In the Byzantine Rite, these words are sung at the Divine Liturgy of Holy Thursday in place of the Cherubic Hymn, and at the distribution of Communion, when they may be repeated several times. These are the the Greek and Old Church Slavonic versions; the traditional Slavonic music is particularly beautiful. Вечери Твоея Тайныя днесь, Сыне Божий, причастника мя приими: не бо врагом Твоим тайну повем, ни лобзания Ти дам яко Иуда, но яко разбойник исповедаю Тя: помяни мя Господи во Царствии Твоем. Coenae tuae mirabili hodie, Filius Dei, socium me accipis. Non enim inimicis tuis hoc mysterium dicam, non tibi dabo osculum, sicuti et Judas: sed sicut latro confitendo te: Memento mei, Domine, in regno tuo. 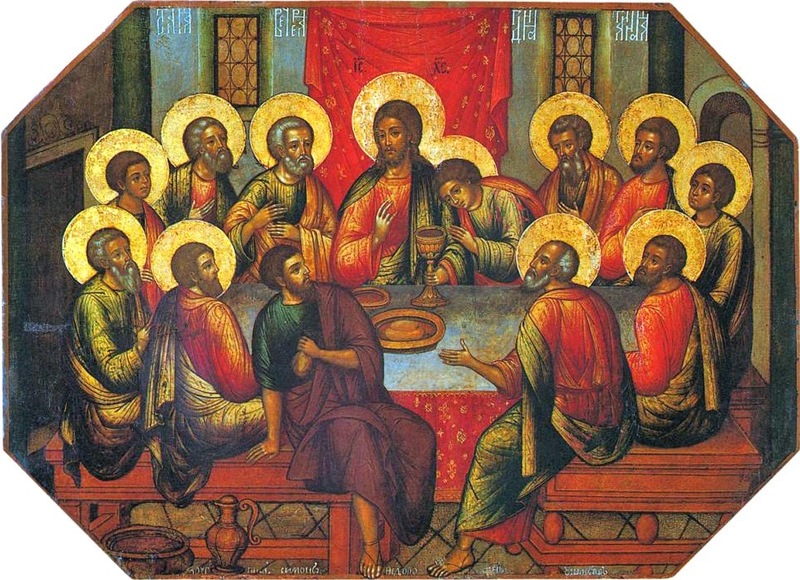 Thou receivest me today, o Son of God, as a companion at Thy wondrous Supper; for I will not tell of this mystery to Thy enemies, I will not give Thee a kiss as did Judas; but like the thief, confessing Thee, (I say): Remember me, o Lord, in Thy kingdom!